Two alleged photos of the HTC One M9 Plus leaked on Chinese social network Weibo. What we're seeing is a 5.2-inch screen HTC One M9 lookalike with a positively huge round camera on the back panel, accompanied by a dual-LED flash. Otherwise, the smartphone is identical in appearance, but it's a bit of a different beast inside. For starters, the 5.2-inch display has a 1440x2560 resolution. The chipsets powering the device will be the MediaTek MT6795 2GHz octa-core processor and the Snapdragon 810 (in a different version). 3GB of RAM are on-board, as well as 32GB of internal storage, a fingerprint reader, and the prodigious BoomSound speakers. Leaks aside, HTC's plans for an upgraded One M9 are rather unclear at this point. It seems there will be such a smartphone in the end, but it could (or not) be sold as a Desire series smartphone in China, powered by the MediaTek SoC, or as the One M9 Plus in Western countries (running on the Qualcomm chip). We'll have to see how this will play out, so if are absolutely jonesing for a One M9, don't be sitting on your cash waiting for the more powerful smartphone. Those images are so fake. The edges of the cameras are enough to toss this whole article in the recycle bin. Then to add the samsung home button on the device in Pic 3 is just plain laughable. 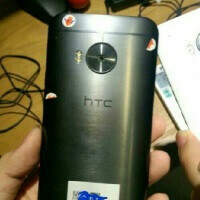 Pic 4 has a barely visible shopped out HTC logo and an off center barcode sticker. Additionally, the home button is not even with the device. And they forgot to Photoshop the other speaker grille back after they pasted the hardware button on there. Clearly fake, as everything else from China. Love the physical button! Finally! Looks better than M9 :) Why?! I found it too square camera feels off the whole design . Some of the photos have a secondary camera, some don't? Is there an explanation despite a careless photoshop job? Needs to be 5.5inch screen! Are you guys crazy? This thing looks retarded. Did a 5 year old design this? Ugliest phone I've ever seen..
Duo camera on the back with a Nexus 5 camera. Front button from a Samsung. Single front speaker?